Downtown music: The President : "Miracle mile"
To set the record straight, the original band was called The President of the United States of America. We often called it The President for short, and of course I had been living in Seattle for a while when the “other” band came along. The band with Elliott Sharp and Frisell played at a dive in midtown Manhattan, the name of which I forget. It was there that some folks from Nonesuch came down. They had already heard Dinner at Eight and The President and it was all of the former and some of the latter that they released, or rather re-released. Both those records were made for budgets in the hundreds of dollars. Bring Yr Camera was made for a budget much, much larger, at the Power Station in NY, and predictably there are many things I like about the low-budget records better in hindsight. I did record many of the classic President tunes on Bring Yr Camera, especially Andre’s Mood (Andre was a favorite cat) and 3 Crows. Neither of them are my favorite readings of these tunes. I felt compelled to fill up a lot of space on Andre’s Mood that traditionally was left more spare. My favorite soloist on 3 Crows was always Stew Cutler, and I just didn’t get that from Elliott. Ironically, it was the newest tunes that sounded best, and speaking of Elliott, his solos on Philip and Hearts Are Broken are incredible, and when he hits the IV chord on Philip I always get chills. This was written years ago for my younger brother, who passed away a few years ago, and the only time I have played this tune since the band broke up was at his memorial at St. Mark’s Church in the Bowery with Doug, Tim Luntzel, Kenny Wollesen and Stew Cutler. I like Our Hands of Water a lot as well. It was one of those things where suddenly we get the big studio and the expensive engineer and it was almost too much. I remember we were all on a “no reverb” kick because we hated the sound of all those ECM records that were swimming in reverb, and actually the engineer had worked with Pat Metheney a lot. The mixes had no vibe and we went back with our tails between our legs and begged for reverb. It was also the era of 20 mikes on the drum set. A lot of reviews back then mentioned the “great Hammond B-3 samples.” Of course it was a real B-3, but that was the decade between the B-3 being forgotten and the great B-3 revival of the 90s and since. We got a lot of nice notices, including my favorite, which mentioned “Sonny Boy Williamson in a Zen Temple.” It was interesting that a lot of critics said it was like fusion music, but anti-fusion at the same time. I could relate to that because I hated what fusion had become – really wretched music, but early Weather Report and Electric Miles Davis meant the world to me. The President didn’t sound like that but it certainly helped to inspire us. Dave Tronzo had replaced Bill Frisell, and he sounded killer, and we had a tour of Europe that had its ups and downs. The next, and last, CD was Miracle Mile, which was somewhere in between. It was all new tunes, and some of it was done like a solo recording, with sequences and some drum machine and some real drums, samples but also lots of real playing. Recorded in NY and Seattle, I think it is a fine record for the most part. Ironically, not that many tunes ended up in the live repertoire. Some of them were hard to reproduce, and probably the most successful tune live was also the most unlikely -Variations on a Theme by W.C. Handy. I started doing a 6 piece version but with only 1 guitar for a while, with Kermit Driscoll on bass, J.A. Deane on samples and amplified trombone, and Stew Cutler. I liked this version because it wasn’t as guitar heavy, and the ambient stuff that Dino did was a perfect contrast to Stew, who tended to lay it down more in the pocket in a way that I think served the original intention of the band. At the same time, beside Elliott’s stellar solos and Tronzo’s, there are moments where Bill’s playing on the first President disc is some of my favorite moments of anything I have ever recorded. Speaking of guitar, with all that talent I still turned to Doug to lay down some of the rhythm guitar. He just had the right thing happening. The last tour was a fun one, with Fred Chalenor on bass, and back to a 5-piece band. This was always a hard band live. The balance had to be just right, and by stripping it down in a way this was by far the most workable incarnation, and we had a good time. Bobby, Doug, Stew, myself and Fred. One day Fred and Stew kept looking at me on the train, and finally Stew said to me, “Man, you can really keep it together.” I asked him what the hell he was talking about. Turns out they had been drinking the night before and got the clever idea to stack a bunch of stuff in front of my hotel room door as a “surprise” in the morning. Thing was, they had the wrong room. Who knows who got the surprise. 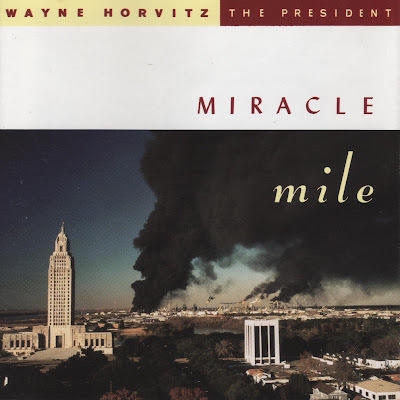 By Wayne Horvitz himself on his blog.